ArtConnects New York. Partner Since 2013. ArtConnects is a charitable organization that connects artists and curators with social service agencies in New York City to create permanent exhibitions of contemporary artwork. The old logo featured a 4-letter acronym with a subordinate name. 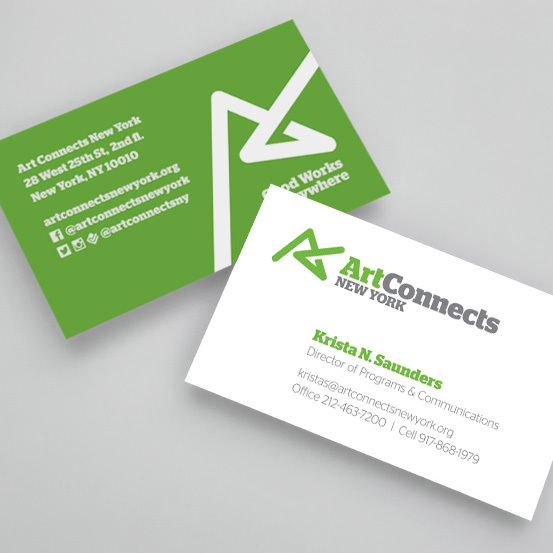 The new identity features the full ArtConnects name prominently, and introduces a new “connection mark”—an abstract monogram derived from the letters A and C. The mark provides a flexible graphic element that creates variety and cohesion among all the branded materials. ©2015 DesignPartner LLC. All rights reserved.